WHY DO RAPPERS PUT ON FAKE ACCENTS? Everyone has an accent. They shape who we are and where we come from. They allow strangers to judge us within a split-second of opening our mouth. And they make average-looking people slightly more attractive. The way a voice sounds impacts the music an artist makes. In the early 00s a group called Silibil ‘n’ Brains fooled the entire music industry and landed a record deal by hiding their Scottish accents underneath a Californian drawl. Mike Skinner moved down from Birmingham and made a record that sounded like he grew up in London. And then there’s Iggy Azalea, the rapper who, ever since her come-up, has been dogged with claims that she adopted a foreign accent. 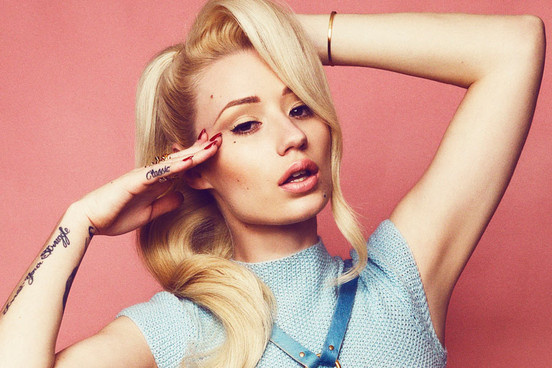 Iggy Azalea left Australia at the age of sixteen to move to Miami. Her parents thought she was going on holiday – but she never came back. She’s now 24, is the first female rapper to appear on the XXL Freshman list, and has worn many different faces. Is the accent switch, from Australian to American, really her fault though? Or is she simply redefining who she is based on where she resides in the world? I phoned up leading linguist David Crystal (seriously, this is the guy you read on day one of any linguistics course) who is about to bring out a book on musical accents called You Say Potato – to find out. David hadn’t heard Iggy’s music before (he prefers folk to “Fancy”), but he did endeavor to assess her authenticity in a fair and simple manner. Noisey: What are the main points of an accent? David: Well, there’s two sides to accents. There’s the segmental side: the vowels and the consonants. And there’s the non-segmental side: the stretches of tone that go over longer pieces of language. Essentially, intonation and tone of voice and rhythm are the two things that make a pronuncation system; which is the basis of any accent. What are the difficulties of singing with an accent? Most of the regional accents that you notice around the world are based mainly on the vowels not the consonants. As soon as you start singing, those vowels start to lengthen and as a result it’s a little bit of a problem to maintain your accent. It’s difficult to tell whether an opera singer is English, Spanish or Italian because the way they open their mouths and elongate the vowels means the regional differences disappear. But what about people who aren’t opera singers? Is it a conscious decision to have an accent while singing? It seems to me that back in the days of early rock’n’roll in England, when everyone was copying Elvis, it was a conscious decision to sound American. People who’d never put an “r” into their vowels would add it into songs. Some may have let it influence them subconsciously as well. But after you get more confident in your own singing style, and time passes, the other influences gradually diminish. Accents can also change the breathing and rhythm during a song, right? I remember Billy Bragg saying you can’t sing a song like “Tracks of my Tears” in a London accent because the cadences are all wrong and you can’t keep the syllables going as long as you want them to. This is because that particular accent is short and choppy compared to the rhythm of the original song’s accent. You have to match your accent to a song’s particular rhythm sometimes. Is there a commercial side to changing your accent? Definitely, you can become more identifiable that way. Who do the singers think their listeners want them to sound like? It’s interesting in something like Eurovision, where virtually everyone sings in English anyway, because maybe that’s a more comfortable style for the singer. The best examples are The Beatles. A recent study found that half of the words in their songs, in which an r would appear after a vowel, had a typical American pronunciation. When the Beatles started they really did experiment with using an American accent but within two years they’d stopped doing it. In the Sgt. Pepper period that amount of times they’d put a vowel after an r had reduced to four or five percent. They turned from using an American accent to their own Liverpudlian accent. There’s usually a big discrepancy between most singers speaking and singing voices. But compare that to someone like Mike Skinner, who sounds like he’s from London when really he’s from Birmingham. It all depends on where you’re from and how strongly you’re tied to there. I mean, is there such thing as being authentic? Singing isn’t that natural, speaking is natural; singing is when emotions get heightened and you want to express yourself in a very different way. The authenticity is in the choices that you make. Whether the speaking and singing voice don’t match up is beside the point for me. Whether I decide to sing in an Irish, Scottish or Welsh accent it’s authentic in the sense that I’ve chosen to do that. If, on the other hand, I see myself following in a tradition of American culture and I aped that accent and I do it well, then that’s being authentic to that type of accent as well. It’s all about who you identify with and want to be perceived to identify with. I guess an awful lot of singers have more than one identity. What about Iggy Azalea? A lot of people have a problem with her because she’s Australian but raps like an American. Rap has a clear style. It uses a rhythm of English that is very distinctive to itself. You’ve got two different types of rhythms: the stress-type rhythm which is used during conversation that goes “te-tum-te-tum-te-tum”. And then there’s the syllable-type rhythm, where the beat occurs on every syllable, rat-a-tat-a-tat instead of te-tum-te-tum-te-tum. Rapping leads more to the rat-a-tat rhythm and comes from the Caribbean way of talking. Anyone who wants to rap has got to respect that. They may respect you, or just laugh in your face. It’s like when Joss Stone – who was born in Devon – turned up to The Brits after touring America and she sounded drastically American. Was the change in her accent really her fault though or do people just ingratiate the accents they hear? Oh yeah. This happens all the time; the technical term for it is called accommodation. It comes down to when two people are talking together, and they like each other, and get on so well their two accents move toward each other and each will sound like the others. Conversely, if two people are talking to each other and they don’t get on, their accents will go further apart. When you go to somewhere with a dominant accent you will very naturally accommodate to it if you’re getting on well with the people. Some people are quicker at adapting than others, maybe even a few days. Is it a very unconscious thing? Yeah, most people don’t notice they are doing it. So Iggy Azaela may be not be guilty for accent crimes? Potentially. I’d have to analyse her accent a bit more. I asked David to analyse two Iggy Azalea videos. One of her being interviewed and the other of her song “Fancy”, to note the difference between the two. Here’s what he said. There are hardly any echoes of her original Australian accent in her speaking voice – just the odd word (eg “own”, “believe”) and inflection. She has developed a mixed accent (like so many people have these days) as a result of her travelling around. When she says “dance” in the interview, for example, it’s strongly American and she inserts an “r” in words like “version”. But it isn’t a pure US accent – she has features that don’t sound out of place in the UK – and as she was in the UK at the time of the interview, maybe she was already accommodating. [“Fancy”] shows she obviously has a good ear and is a good mimic – he accent shifts in several directions, all US rap-influenced, especially in the last minute of the song. There also seems to be a conscious search for special voice effects in the final riffs, which presumably were part of the song’s success.